The lawyer for an Ohio youth who pleaded guilty in the fatal shooting of three high school students was caught by surprise at the sentencing hearing on Tuesday when his client removed his button-down shirt. 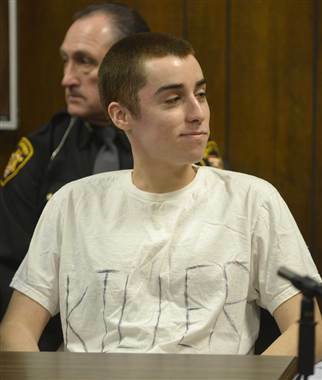 Defendant T.J. Lane revealed a T-shirt with the word "killer" written in black marker, report NewsNet5.com, the Cleveland Plain Dealer, ABC News and the New York Times blog the Lede. The same message was on Lane's T-shirt on the day of February 2012 killings in the cafeteria at Chardon High School. Defense attorney Ian Friedman talked to NewsNet5.com about the reaction. "I think everyone in that courtroom was shocked today," he said. "It was something that was not expected." Lane also shocked onlookers when he made a "vile and unprintable" courtroom statement about what he did while remembering the shootings, ABC News says. Lane also flipped the bird and said, "F--- all of you." Before Lane spoke, Friedman told the judge he had "strongly urged" against it. Lane was sentenced to three life sentences without parole. NewsNet5.com asked Friedman if he would ever take on such a case in the future. Friedman said he hoped there wouldn’t be such a case, but "I would do it over again." "It’s this sort of case that needs a lawyer. It’s not the popular case," he said. "It’s the exact opposite. Because if you allow the protections under the law to erode or not to be applied to a certain individual because of the heinous nature of the crime, then those laws are going not be in the place down the road potentially when there’s someone who really needs them, someone who is possibly innocent."